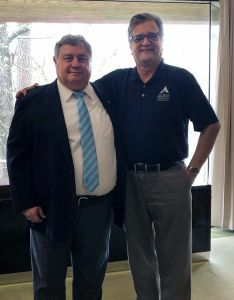 Academy President and CEO Dr. T.J. Rosandich and ACBSP accreditation consultant Carlos Aquino. The United States Sports Academy has begun the formal process of attaining accreditation for its sports management program through the Accreditation Council for Business Schools and Programs (ACBSP). The ACBSP is a leading organization offering accreditation services to business degree programs focused on teaching and learning. Becoming a candidate starts the accreditation process, and candidates must develop an action plan for meeting ACBSP’s standards and criteria. In order to meet the ACBSP accreditation standards the Academy has hired a consultant who will guide the institution through the process. The Academy welcomed its ACBSP consultant Carlos Aquino to campus for his initial visit with its ACBSP Accreditation Committee, which consists of members of the institution’s faculty. “ACBSP accreditation is a paradigm shift for the Academy,” Academy Vice President of Academy Affairs Dr. Tomi Wahlström said. “Rather than focusing on offering sports management programs to sports professionals alone, this accreditation will help us to offer sports management as an option to management professionals. Wahlström said the typical timeline to become ACBSP accredited is three years, but the process could be finished as early as 18 months. Founded in 1988, the Accreditation Council for Business Schools and Programs (ACBSP) is a global business education accrediting body and the only organization to offer accreditation to all levels of collegiate business educational degree programs from associate to doctoral. ACBSP ignites a standard of excellence with an accreditation process based on the Baldrige Education Criteria for Performance Excellence. By evaluating aspects of leadership, strategic planning, relationships with stakeholders, quality of academic programs, faculty credentials, and educational support, ACBSP assesses whether or not business programs offer a rigorous educational experience and commitment to continuous quality improvement.